Stone countertops are definitely among the most popular countertops Dallas on the market nowadays. Of course, when deciding to remodel your home, you would want to consider first all possible options. It holds true that there are many materials used in countertops, but when it comes to popularity and reliability, nothing can beat natural stone countertops. And if you are not convinced, check out the benefits below. Natural stone countertops in Dallas last a lifetime. They are incredibly durable, require minimal maintenance, and can even withstand the spills, accidents, and mishaps that often accompany day-to-day living. Hot cups of coffee, spilled wine, and slicing knives rarely damage this type of countertop material. Granite and marble countertops are without a doubt the most popular ones. They both immediately transform a kitchen or bathroom from good to great. While aesthetics may be subjective, the tangible response people have to natural stone countertops is always positive because they look so great. No two slabs of stone countertops in Dallas are exactly alike, meaning you can truly create a one-of-a-kind kitchen or bathroom by choosing them for your countertops. You can also work with a countertop fabricator to find a color and design pattern that fits the personality and character of any room. Of all the countertop materials available to you, none will enhance the overall value of your home like natural stone. They are always desirable and always in style. They are, in a sense, timeless but at the same time contemporary. Many homebuyers have made the decision to buy based on the natural stone countertops alone. Because each slab of natural stone is cut specifically for your counters, you can incorporate them into any design you desire. Whether you want a kitchen island that is shaped like a T or a round vanity in your closet, your fabricator can cut your slab to order. With this type of countertop material, you truly have the flexibility to design the counters of your dreams. 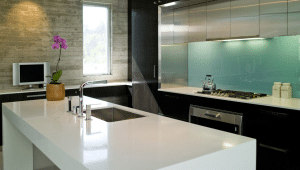 Are you now convinced of the prowess of stone countertops in Dallas? Contact us now at Hard Rock Imports. We offer premium-grade natural stone at affordable rates. For no cost, no obligation design estimate, call us today! We will be more than happy to help you out. PreviousPrevious post:The Great Advantages of Marble Vanity CountertopsNextNext post:Seriously, Where Should I Buy Granite Countertops in Dallas?